This McKettrick brother was ready for trouble, but not for her**… Don’t miss this reader favorite from #1** New York Times bestselling author Linda Lael Miller. When news arrived that there was trouble back in Texas, Holt McKettrick left a mail-order bride and his family on the spot. He just prayed he’d be in time to save the man who had raised him as a son and keep his best friend from the gallows. 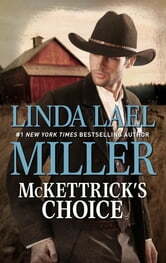 He knew he’d encounter rustlers, scoundrels and thieves, but he’d never expected to find a woman like Lorelei Fellows. I love this series. A little mystery and love of family.